Neda Soltan was not political. She did not vote in the Iranian presidential election on June 12. The young student was appalled, however, by the way that the regime shamelessly rigged the result and reinstalled Mahmoud Ahmadinejad. Ignoring the pleas of her family, she went with her music teacher eight days later to join a huge opposition demonstration in Tehran. Her name was invoked by Barack Obama, Gordon Brown and other world leaders. 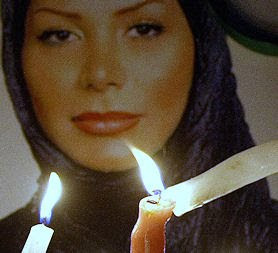 Outside Iranian embassies huge crowds of protesters staged candlelit vigils, held up her picture, or wore T-shirts proclaiming, “NEDA — Nothing Except Democracy Acceptable”. The internet was flooded with tributes, poems and songs. The exiled son of the Shah of Iran carried her photograph in his chest pocket. It was not hard to see why Ms Soltan so quickly became the face of the opposition, the Iranian equivalent of the young man who confronted China’s tanks during the Tiananmen Square demonstrations 20 years earlier. She was young and pretty, innocent, brave and modern. She wore make-up beneath her mandatory headscarf, jeans and trainers beneath her long, black coat, and liked to travel. She transcended the narrow confines of religion, nationality and ideology. She evoked almost universal empathy. The story of her death was so potent that the regime went to extraordinary lengths to suppress it. It banned a mourning ceremony, tore down black banners outside her home, and insisted that her funeral be private. It ordered her family to stay silent. In the subsequent weeks any number of leading officials, ayatollahs included, sought to blame her death on British and American intelligence agencies, the opposition, and even the BBC — accusing its soon-to-beexpelled Tehran correspondent, Jon Leyne, of arranging her death so that he could get good pictures. The regime announced investigations that, to no one’s surprise, exonerated it and all its agents. It managed to coerce Ms Soltan’s music teacher into changing his story, but it failed to do the same with Mr Makan, despite imprisoning him for 65 days — many of them in solitary confinement. Released on bail, he fled the country — making a five-day overland journey to escape. Dr Hejazi also fled, back to Oxford where he had been taking a postgraduate course in publishing. There he confirmed in an interview in The Times that Ms Soltan was shot by a Basij militiaman on a motorcycle. But the regime still hounds him. It has harassed his family in Tehran, is trying to close his publishing company in the capital, and has accused him of helping British agents to kill Ms Soltan. It stages demonstrations outside the British Embassy demanding his extradition. He would be arrested the moment he returned to Tehran, meaning that he, his wife and infant son are now exiles. Back in Tehran, the regime tried to buy off Ms Soltan’s parents by promising them a pension if they agreed that their daughter was a “martyr” killed by foreign agents.